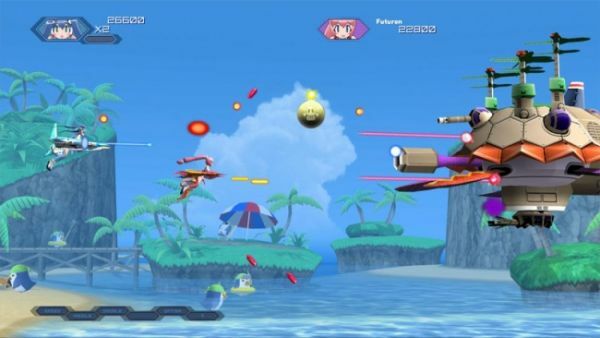 We admit we love a good co-op Shoot 'em Up, and the Japanese game Otomedius Gorgeous is just that - a great Shoot 'em Up. Unfortunately that game will never see American soil unless you have some imported stuff, so we can look forward to the sequel instead. Otomedius Excellent will be headed our way complete with co-op straight from the brilliant minds at Konami entertainment. "As the sequel to the 2008 Japanese hit Otomedius Gorgeous, Otomedius Excellent boasts a significant visual and gameplay update since its predecessor, Accompanied by brilliant graphics and an excellent soundtrack, Otomedius Excellent will engage fans with the Gradius franchise on a whole new level." Otomedius Excellent may be a mouthful to spit out, but it may well be worth it with its local and online 3-player co-op system over Xbox Live. Oh, and because we like a bit of variety in our games - Otomedius Excellent will not just have general ships in it. Instead, each ship is part of a, well, girl. It's a very interesting concept that we will try out as soon as we get a chance.